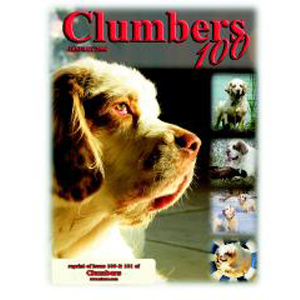 This is a massive 100 page celebration of the fabulous Clumber Spaniel , a reprint of the combined issues 100 & 101 of the famous Clumber Spaniel magazine. There are 23 articles and features from around the world covering all aspects of Clumbers and Clumbering, with tons of photos (all in b&w). From collectibles to nurturing the new born, field to show, history to the present day – the lot! Judging is a very serious business and I would advise anyone taking up these appointments to really work at. Learn the standard, study gait and movement, learn what balance means and, as rider, to all this, learn to read when a dog is comfortable and at ease. Judge this year was Maine Sterner and the trial was held at Maines farm on her grounds in Tidaholm, Sweden. Main did judge this competition once before and was looking forward to joining the Clumber people for a day of hunting. Most of the figurines/sculptures I picked up on eBay and many were (most of my favourites) sculpted for us by Donna Eddy from photos of our pups. She’s very talented, does all breeds and horse sculptures. I had worked tirelessly since the initial phone call. I had to write the Clumber info for the internet web site by Wednesday 9am. I did not have time to get his edited by other members but I feel I did justice to the breed. In Canada having access to upland game birds for training is a rare treat as they are seldom available, and if we are lucky enough to get a few birds finding a place to be able to shoot is difficult as we live in an urban area. Obstacle performance is really only a small part of the training process. Much more important is the trust and communication established through body cues. It takes the handler a great deal longer than the dog to learn this, but once the handler gets it right, so does the dog! I first became involved with Clumbers in 1967 when I helped out at the Gamewood Kennels of Mrs Reta Goodger near Maidstone, Kent – comprehensive article with loads of photos! Sharon Holland & the club present photos of the winners from America’s second breed club, from 2003 to 2005 featuring some of America’s top and most famous Clumbers. One hundred years ago Clumbers were “the gun dog” for working, before Cockers/Springers were bred and took over in the shooting field. Fashion changed – but so did the Clumber mainly in weight. IN 1859 the weight was described as 40lbs. In the Czech republic we have the KCHLS – Hunting Trackers Breeders’ Club and the breeds covered are the English Cocker Spaniel, Welsh Springer Spaniel, English Springer Spaniel, Field Spaniel, Sussex Spaniel, Irish Water Spaniel, American Water Spaniel, Deutscher Wachtelhund, Espanil Acutico Can, Cao de Aqua, all Labradors and of course the Clumber Spaniel. A review of the Myra Savant Harris Seminar part 1 of 3 The litter was dropped nine days early on the end of her bed and mom went back to watching Animal Planet. Mom had no overwhelming desire to mother at all. She found the white Poodle on Animal Planet much more interesting than the wet wiggling thing she had deposited on the bed. The round, soft, squirming, furry sausage of creamy white with lemon drops wriggled its way across Irene and Ron Packer’s carpet and into their hearts. The Swedish Club take us through the history of their show with photos of all their Best in Show winners from Qlummies Quincy Jons in 1981 to Chatarays Sahlene in 2005, with comments and notes and mayny of the Reserve in Show winners featured to. My favourite evenings are when we are able to go to the wards and visit the children who are not able to come to the gym. I always have trouble with Tess because, once she gets on a chair beside a child’s bed, she thinks she should be on the bed curled up with the child. It is so heartwarming to see the smiles, to hear them speak, to hear the care givers day she or he hasn’t smiled for days or spoken a word. These gorgeous big white “teddy bears” bring such joy to these very special children. Karen Johnstone & Lyn Durrington share some of the tales of the puppy Bundy doing his carer training and his uncle Oliver who is a self taught hospital and nursing home visitor between times as a top performing show Clumber. He sees the harness and the line and it starts. Like a white blur he scurries to the door. Impatient he rushes back to you, makes a mad dash through the house and bounces at the door, a plume of white fur slowly settling in the still air. You clip on his lead and open the door. Like an out-of-control freight train he drags you down the steps, doing loops around you, binding your appendages together with his lead. Stumbling and laughing you open the van and he flies into the crate. He knows. A look at Australia’s first ever Clumber shows Best in Show winner and the winners of the “Clumbers” Australian & New Zealand point score winners from 1987 to 2005 with photos of all, plus the announcement of the 2005 award winners. Full photo gallery of Australia and New Zealand’s greatest modern Clumbers. A photo record of the winners on the 2005 southern Ireland four show circuit and a celebration of their wins and wins for the breed at Clonmel in the Brace Stakes and Killarney’s Puppy Stakes. PDH stands for Pyruvate Dehyrogenase Deficiency and relates to the absence of a crucial enzyme in one of the biochemical pathways which occurs in all cells. As an observer you will witness a dog with various expressions, but most often an owner will complain of the pup’s inability to walk comfortably without sitting for more than a hundred paces or so. As you can see Rescue, Showing and Judging took over my life, and I achieved my ambition in 1981 of owning my first Clumber Spaniel (wh had been rescued). Sadly owing to the trauma of his early life we only had him for a few months but I hope we made the end of his life happy. I then bought my first Clumber puppy in 1982, within a very short time I was invited to become a member of the club committee.